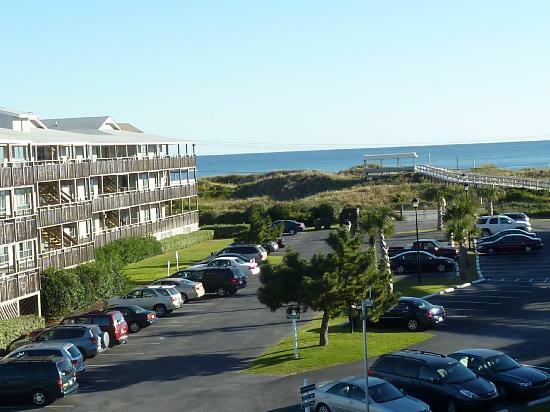 Peppertree Resort Atlantic Beach North Carolina offers spacious one and two bedroom condo vacation rentals. The resort is oceanfront but, due to the east-west orientation of the resort buildings and the high dunes, many of the condos have limited or no ocean views. This is a large resort, and our unit numbers are assigned at check-in, so please be aware, we cannot guarantee ocean views from our lodging accommodations. The one bedroom condos have sleeping arrangements for 4 people (queen and queen sofa bed), with 1 bath, full kitchen, and deck or patio. The two bedroom condos accommodate up to 6 people (2 queen beds and 1 queen sofa sleeper bed), with 2 baths, full kitchen, and deck or patio. Responsible guest must meet minimum 25 years age requirement. The regular rate for this week is $2629 (source: Expedia). Save over 50% off when you rent from us! The prices shown are the TOTAL prices. There are NO additional charges (such as occupancy, sales or lodging taxes, cleaning fees, deposits, booking fees, etc.). The price you see is the price you pay! Atlantic Beach is the grand daddy of the five resort towns along the Bogue Banks of North Carolina’s coast. This area is often referred to as the “Crystal Coast.” You’ll remember fondly your time — Peppertree is a peaceful vacation oasis. It’s a short walk down the boardwalk from your villa to the white, sandy beach, where you can rent beach equipment. Get some sun, take a dip in the surf or the pool, then head out into the surrounding communities for delightfully fresh local seafood. Whether you like to swim, bask in the sun, sail or fish, Atlantic Beach is the ideal spot for a reasonably priced family trip, a romantic escape, or a beach bum’s ideal vacation.